Sit back and imagine that you spent last night binging on Netflix and drinking wine. You knew it was late, but you just kept thinking “one more episode…” and that turned in to three or four more episodes. Now your kids are up at 7:00AM and you have only had about 5 hours of sleep. It’s all too familiar, right? So, what decisions do you make next? A huge problem that stems from the lack of sleep is that you start to make bad decisions. You may be too tired to make breakfast so you either heat up a frozen waffle or skip breakfast altogether. Because of this mixed with the lack of sleep, you start having cravings and eating junk because you’re still too tired to even think about cooking a healthy meal. And forget about the gym, there’s no energy for that! The thing is, if you don’t have enough energy from one source, your body will go looking for it somewhere else. Unfortunately, the easiest “quick energy” available to most of us is sugary junk food, so sleep deprivation is sending us straight to the drive through or to the corner store. As a matter of fact, if you feel like you have been doing everything right… eating well, exercising, etc, but are still not seeing any results- consider your sleep habits. Are you getting at least seven hours of sleep each night? If you do not sleep well your body doesn’t recover properly and you don’t burn fat or build muscle efficient enough. On top of that, it will mess up your metabolism and cause cravings. And, of course, you don’t have as much energy to do things like burn calories or cook healthy meals. To boot, not sleeping enough—less than seven hours of sleep per night—can reduce and undo the benefits of dieting, according to research published in the Annals of Internal Medicine. Successful, long-term weight loss means finding a sleep schedule that makes you feel energized and ready to take on the day. 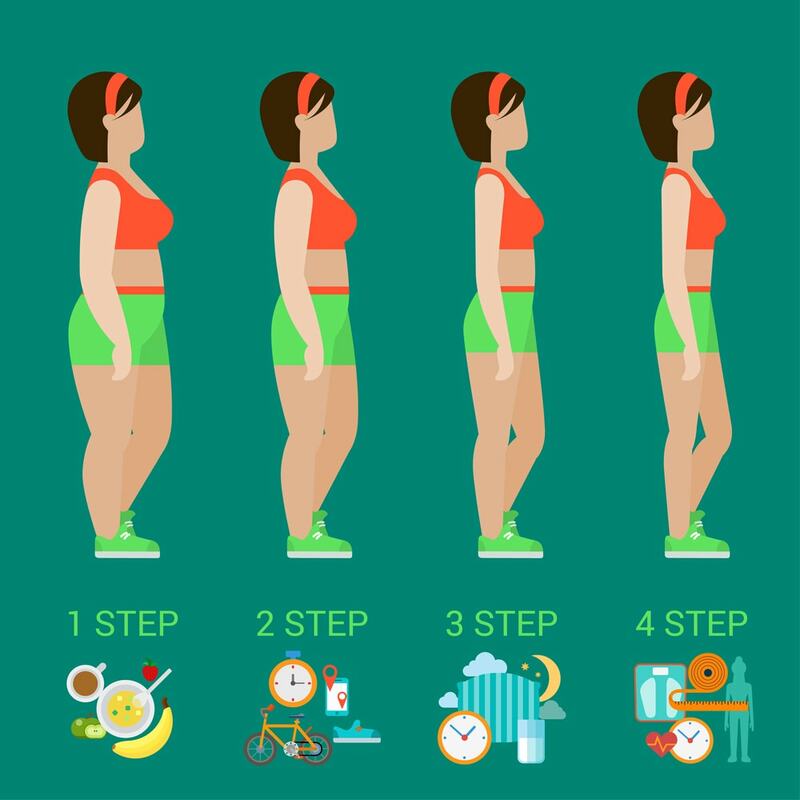 Sleep deprivation can seriously throw off your behavior patterns and your body’s response to food, sabotaging your weight-loss efforts in several different ways. Okay, but how do I get enough sleep?! You know what time you have to be up in the mornings, so count back 8 hours from that time and make that your bed time. So if you have to be up at 7:00AM, your bed time is 11:00PM. Now that you know your bed time, set your alarm for two hours before then. If you’re bed time is 11:00PM, set your alarm for 9:00PM. When your alarm goes off, start your own bedtime routine… there’s a reason this works so well for your kids! Turn off all of your electronics, it’s time to calm your overactive mind. Take a nice long shower or bath, read, meditate, do yoga, drink some tea… whatever relaxes you. Any thinking or planning you need to do can be done during this quiet time. That’ll stop you from thinking about it for hours at 11:00PM when you should already be sleeping. Here’s the key, ya’ll. You want to walk in to your room and immediately feel relaxed and ready to jump in to a nice and cozy mattress. So, how do you do that? Make your room an electronic-free zone. When you hit your room, keep the lights low or off. Do not scroll through your phone, do not watch TV… just lay in bed and relax. 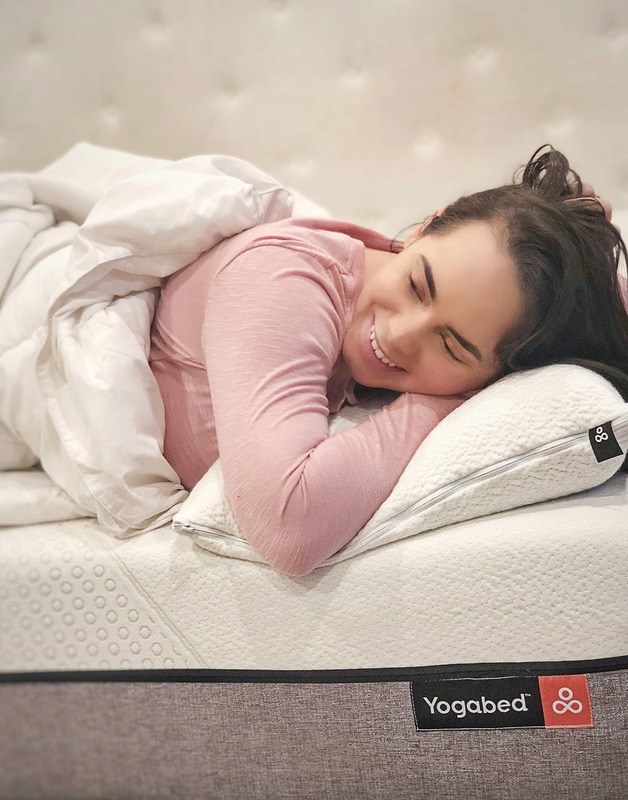 It has Instant Response YogaFoam™ memory foam that is crazy comfortable and makes you feel like you’re sleeping on a cloud. 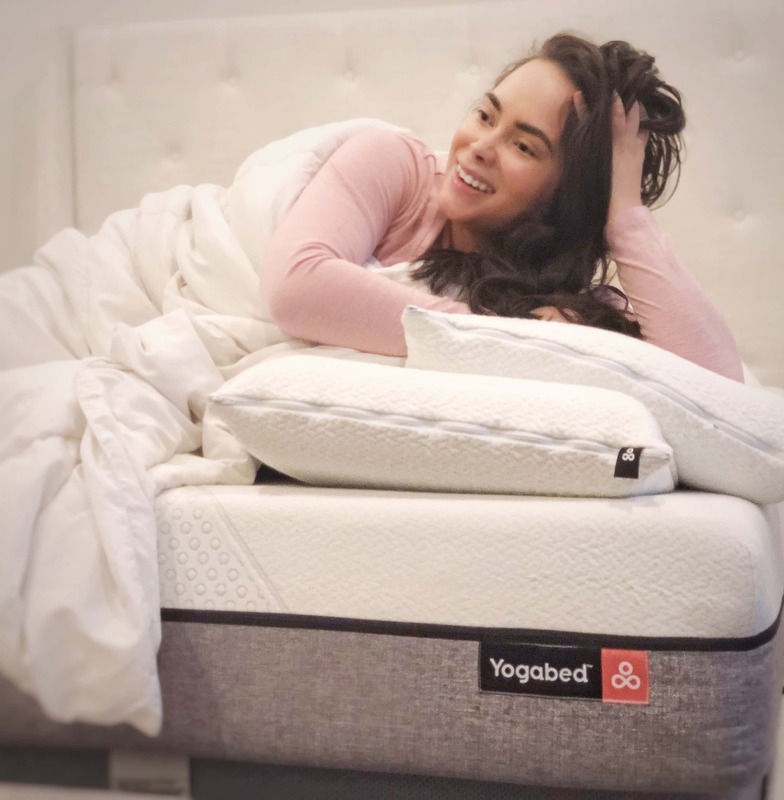 It’s ventilated design includes a layer of exclusive cooling YogaGel™ memory foam that keeps you cool all night long instead of making you hot like other mattresses. 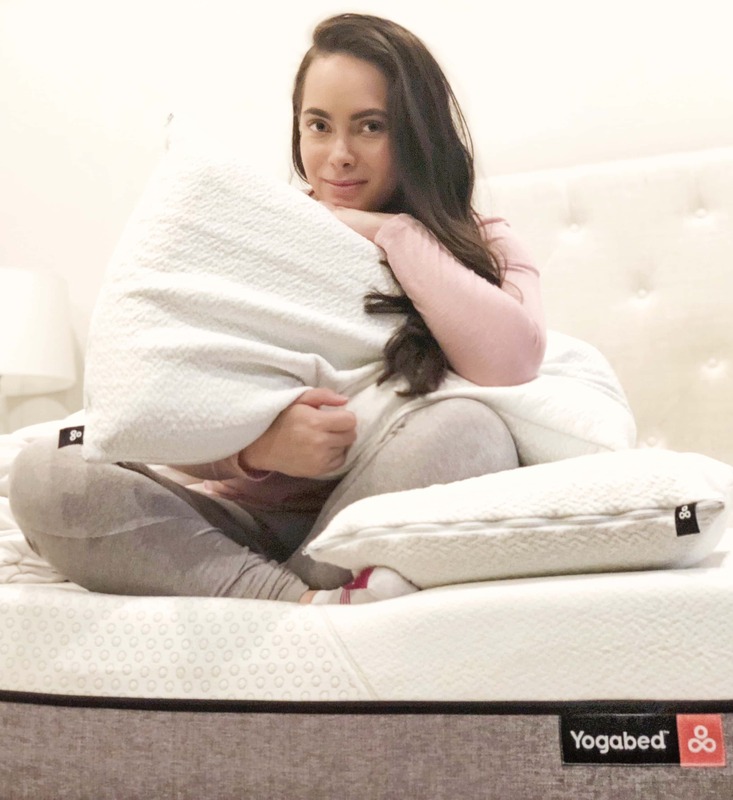 It comes with a removable mattress cover that has an easy-glide zipper and is machine washable— it literally goes on & off in just 30 seconds. This also helps keep your sleep environment super clean, allergen-free and fresh-smelling! 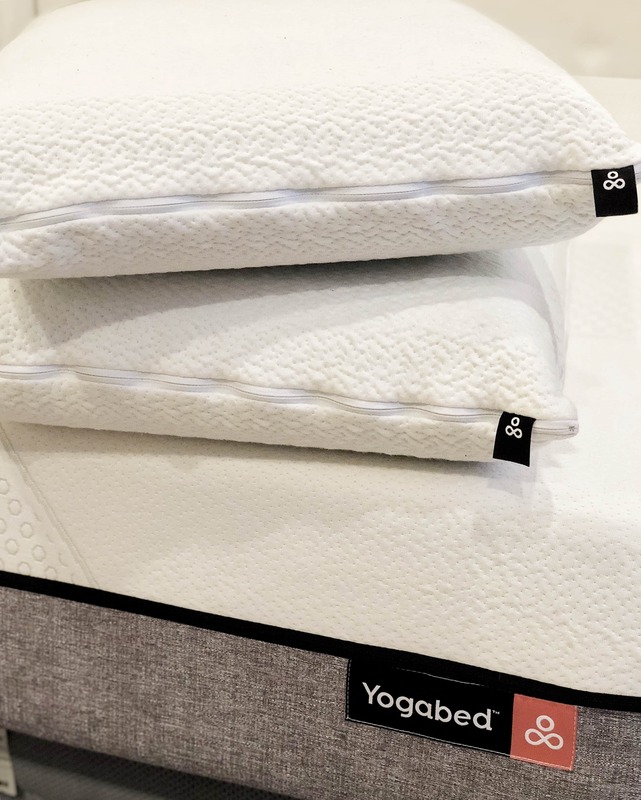 The Marpac Yogabed mattresses are made in the USA! You also need comfortable and supportive pillows to complete the package. 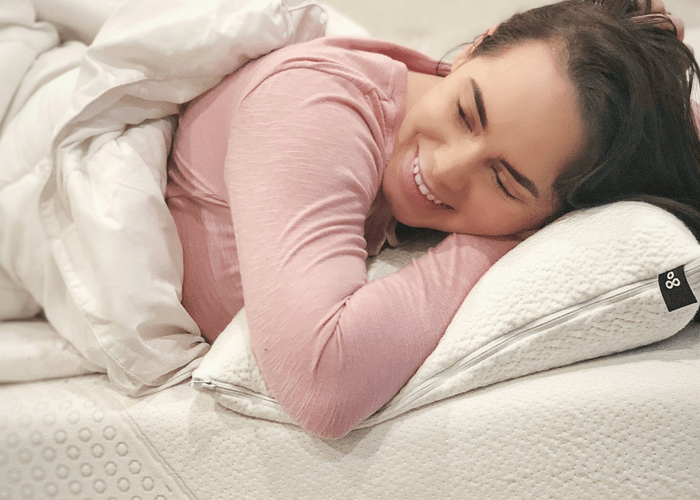 I use the Marpac Clean Sleep Memory Foam Pillows. I like these because they are soft enough to sleep on but still supportive enough to help avoid neck pain. steadily drops naturally while we are sleeping to promote deeper sleep, and keeping our body cool at night helps us stay in that deep sleep longer. That’s one of the reasons I love the Marpac Yogabed, it keeps you cool all night with it’s YogaGel. Listen to relaxing sounds. Do you ever notice how much better you sleep when the air conditioner is running or a fan is on? White noise is just so relaxing! Marpac is actually also the maker of the original white noise machine Dohm. I have used these in both my room and in my kids room for many years and it helps a ton with sleep. As a matter of fact, I can’t sleep without it. It covers all of the city noise going on outside and even drowns out my husbands snoring. I highly recommend trying it! So there you have it ladies, now that you know the importance of sleep for weight loss, go ahead and get a good mattress and start a bedtime routine of your own. Then watch how much better you start to feel and how much more consistent you are with your weight loss goals! Now I’m off to start my own bedtime routine… and if you’re up reading this past your bedtime, you should do the same! Disclosure: I received the Marpac Yogabed for free in exchange for my thoughts and opinions. All opinions are my own.